The Parish Council received Rural Community Energy Fund (RCEF) Grant from WRAP. WRAP is a not for profit organisation who works with Government, local communities and businesses to delivery practical solutions to improve energy resource efficiency. The RCEF is a £15 million programme, delivered by WRAP and jointly funded by the Department for Environment, Food and Rural Affairs (Defra) and the Department for Business, Energy & Industrial Strategy (DBEIS). It supports rural communities in England to develop renewable energy projects which provide economic and social benefits to the community. The RCEF Grant was to pay for investigations into renewable energy project feasibility on Parish Council owned land, for the potential benefits of the people of the parish. The Parish Council owns several pieces of land in the Parish, all of which is located on the Rampton side of the Woodbeck crossroads. The funding from RCEF allowed the Parish Council to employ the services of an energy consultant, Chris McDonagh of Emerald Environmental Ltd. The reason for choosing Emerald was Chris's strong planning and consultation experience in similar renewable energy projects and his planning authority background. Chris and his team of technical experts have undertaken investigations into the possibilities for wind, solar or biomass district heating systems on Parish Council land. The outcome of the study was that solar and wind were not viable at the moment due to both the large connection costs by Western Power Distribution and the inability of the network to cope with the additional load of the solar or wind farms. A technical site survey was then undertaken of all parish council land in 2018. The result of the survey was that the ideal location for a potential district heating boiler would be to use a section of the unused clay heavy piece of parish council land on South Inge Yard in-between Pinder Park and and the agricultural field rented to a local farmer. 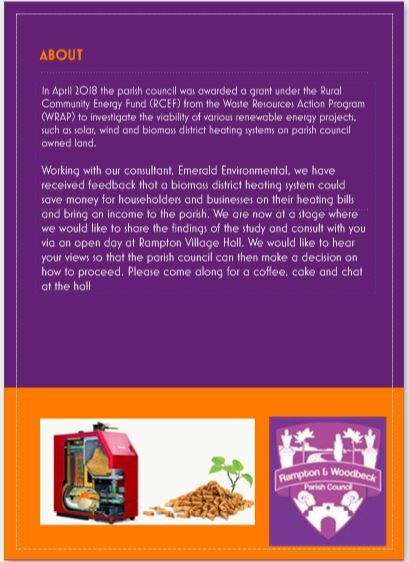 As part of the Grant the Council has received, we have now written to each householder in Rampton, please either reply by email or pop your written comments on the return slip and post in the Village Hall Post Box. 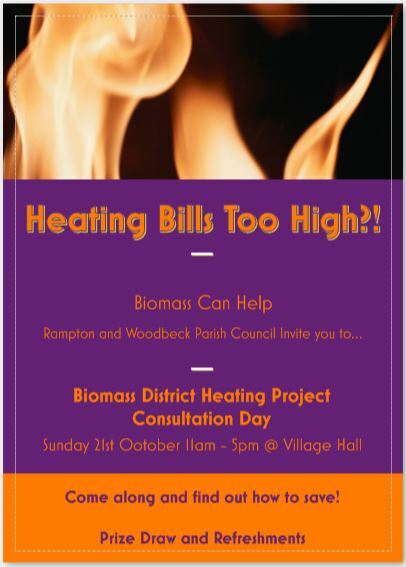 If the district heating system is to be considered we need to receive enough properties in Rampton who would be willing to be considered for the system. If enough people say they are interested, our energy consultants can then work on the potential number of people on the system to work out how much savings could be achieved per household on heating and/or hot water, (this could be anything from 20% to 60%). 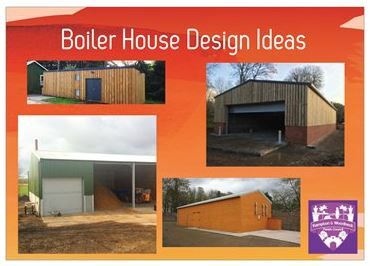 The System could be compatible with a variety of existing systems, for example, it doesn't just work for Oil boilers, if you have already got a private biomass boiler at home, the district system could potentially subsidise your existing biomass system. The Council met on Monday to discuss the findings, 78 responses were received, no response was received from 187 properties a 29.3% turnout of the population. 59 properties were interested in joining the system, 19 were not interested. The energy consultants have confirmed they would need around 220 properties to be willing to connect so the project will be abandoned. However, I must clarify that all the costs associated with investigating the potential of the heating system have been covered by a Govt RCEF grant and not at the expense of the people of the parish. The actual open day had been successful with people constantly coming to the hall all day and it also provided an opportunity for people to interact with parish and district Councillors as well as meet Bassetlaw Council who put a stand on to interact with the public.